HSP’s collections document the experiences of over sixty ethnic groups in the United States. Areas of strength include African American, Chinese, German, Greek, Irish, Italian, Japanese, Jewish, Native American, Polish, Puerto Rican, Slovak, and Ukrainian communities in the United States. There is also substantial documentation on the history of American nativism and ethnic stereotyping. The following is a small sampling of collections and sources available at HSP. Please refer to our online catalog for information about our books, images, journals, manuscripts, maps, and other items in our collection. You may also want to browse through the Balch Manuscript Guide, which describes holdings by ethnic designation. You can also contact a Reference Librarian for further assistance. Finding aids or inventories are available for many of these collections. Many are referenced directly from that collection's record in our online catalog; other finding aids are posted here. In some cases, finding aids are available only in paper format at HSP's Reference Desk. See a Reference Librarian for assistance. published and unpublished materials regarding ethnic persecution and resistance. (0.4 linear feet) A Lebanese singer, dancer, actress, writer, and storyteller, Atiyeh came to the United States as a young child. She was raised in Chicago by her grandparents, who maintained Middle Eastern traditions. Atiyeh studied voice under the direction of Ruth Julia Hall and made her professional debut in Chicago in 1932. Atiyeh performed traditional music, dance, and storytelling throughout the Midwest, eventually settling in New York City. In addition to a number of short stories, Atiyeh authored a Middle Eastern cookbook. The collection contains programs, reviews, publicity and public relations announcements, scripts and music from her productions, writings, correspondence, and published works. (44.5 linear feet) The first successful Greek language newspaper published in America, Atlantis was founded in 1894 by Solon J. and Demetrius J. Vlasto. The paper was headed by a member of the Vlasto family until it closed in 1973. Published in New York City, it had a national circulation and influence. Atlantis supported the royalist faction in Greek politics until the mid-1960s. Other recurring editorial themes include naturalization, war relief, Greek-American business interests, and Greek religious unity. The records include legal files, correspondence, scrapbooks, subscription records, tax returns, financial ledgers and labor files that span the newspaper's entire history. Legal files include translations from Panhellinios, National Herald and other rival newspapers, as well as documentation of Atlantis' compliance with the 1917 Trading with the Enemy Act. Editorial files before 1963 are missing. Labor relations files and financial records are especially extensive. (3.0 linear feet) The collection contains sheet music representing or created by members of a variety of ethnic groups, much of it reflecting stereotypes. Boxes 1 and 2 are labeled Greek. The most prevalent materials are related to the following ethnic groups: African-American (spirituals, minstrel songs, folk songs), Jewish, Greek, Italian, Irish, and Scandinavian. (1.2 linear feet) Joseph E. Beck (1904-1981), a native of Racine, Wisconsin, was a social worker who helped Jewish refugees during World War II. Having previously worked for various social agencies in Cleveland, Ohio, and Scranton, Pennsylvania, Beck became the executive director of the Jewish Family Society of Philadelphia in 1934. He headed this organization until 1942 when he accepted the executive directorship of the National Refugee Service, in New York City. He left this organization in 1950 and moved to California, where he continued social work and eventually retired. This small yet vivid collection includes correspondence, family records, photographs, clippings, and 16mm films. The majority of the collection is comprised of Beck's candid and personal writings on a variety of social, political, and cultural topics. Many of these writings were used in Beck's autobiography, a copy of which is also in this collection. (4.75 linear feet) This collection contains printed material from the library of Abraham Harley Cassel, a book collector and historian who acquired over 50,000 books, pamphlets, and documents about early Pennsylvania history. Cassel was a member of the Dunkard Brethren who wrote about and collected books on early Pennsylvania German religious history. His library attracted scholars and historians of Pennsylvania and German American history, and at his death was divided among archives, libraries, and private collectors. The portion of Cassel's collection that is housed at HSP contains forty-seven items which range in date from 1680 to 1893. Items are arranged in alphabetical order, with volumes relating to the Ephrata religious community and the Schwenkfelder Church grouped together. This collection includes hymn books, religious tracts and catechism, diaries, letters, genealogical records, and examples of Pennsylvania German folk art and fraktur. (17.0 linear feet) A historian and foundation administrator, Clark has written extensively on the Irish immigrant in urban society and Irish life in Philadelphia. The collection consists primarily of research materials, including research papers, drafts of Clark's writings, articles and clippings, correspondence, manuscripts, book reviews, cassettes, artwork and other materials. Also present are materials relating to the Clan-na-Gael of Philadelphia. The collection contains unprocessed additions. Clark's diaries are available on microfilm. In English. (5.8 linear feet) James Joyce Cleary (1888-1974) was a published writer, an athlete, a worker, a socialist, and a father. Born in Ireland, Cleary immigrated to the United States when he was a teenager, living first in New York City and then in Philadelphia, where he settled and formed a small family. He worked at several different kinds of jobs during his life, but eventually started his own grocery business, Golden Dawn. This collection is rich with materials that Cleary collected and created, including his poems and prose writings, some of which were published in local newspapers, and his personal financial, legal, and work-related documents. Additionally, Cleary saved sports programs, family papers, and numerous clippings from newspapers and magazines. From some of these clippings, Cleary made large, full scrapbooks that define eras in news and pictures. Also in this collection is a sizable amount of pro-socialist and pro-Soviet literature, clippings from Henry Ford's Dearborn Independent, and several Irish newspapers. (3.2 linear feet) Concerned Citizens of North Camden was founded in 1978 as a grassroots organization dedicated to revitalizing the North Camden neighborhood of Camden, New Jersey, and empowering its residents. CCNC's work focused above all on providing better housing through a combination of public advocacy and community initiative to rehabilitate abandoned housing stock. Other areas of concern included cleaner streets, employment and job training, legal aid, neighborhood safety, and overall community development. The collection includes correspondence, administrative records, newsletters, flyers, and other materials. Portions of the collection are restricted. (54.5 linear feet) Covello was born in Avigliano, Basilicata, Italy, and immigrated to East Harlem, New York City, with his family in 1896. He was a teacher and administrator in the New York City public school system, author of The Social Background of the Italo-American School Child and other studies, and a leader in the intercultural education movement and in the Italian-American community. The papers document Covello's career as a teacher at DeWitt Clinton High School, principal of Benjamin Franklin High School, East Harlem, and educational consultant to the Migration Division of the Puerto Rican Department of Labor, as well as his research on Italian-American immigrants and Puerto Ricans, especially in East Harlem, and his activities in the Italian-American community. The collection includes correspondence, his files as an educator, extensive research and writing files, records from organizations, and printed materials. This collection documents many overlapping topics, such as the history of education and educational theory, immigrant children and youth, assimilation versus retaining immigrant heritage, demographic changes in East Harlem, progressive politics in New York City (especially for 1930s-1960s), Italian-American and Puerto Rican communities in New York City (and their interaction), the history of social science research, and other topics. There is correspondence with prominent figures such as Fiorella La Guardia and Vito Marcantonio, and letters concerning the formation of Columbia University's Casa Italiana. (9.4 linear feet) Angelo Fiorani was born in Tarquinia, Italy and came to America ca. 1905. Rose Florey Fiorani was born in Scranton, Pennsylvania in 1902. Beginning in 1933, the Fioranis worked as "time brokers" for radio programming targeting Italian Americans and broadcast Italian programs on Scranton-area radio stations, eventually owning and operating their own station, WPTS. The collection documents the Fioranis' forty-two years in broadcasting. It contains personal and business correspondence, advertisements and advertising account files, program schedules and scripts, financial records, uncatalogued photographs, fan mail, and souvenir programs of special events. In English and Italian. Register available. (12.3 linear feet) The French Benevolent Society was founded in Philadelphia in 1793. The society serves indigents of French descent and provides scholarships to local students of French extraction. The records include minutes, correspondence, financial and membership records, case files, histories, and uncataloged photographs. (3.9 linear feet) Victor Gondos, a civil engineer, immigrated to the United States with his family in 1911, settling in Chicago. He married Irene Trautmann, and they had two sons, Zoltan (later Robert) and Victor Jr. In the 1920s they moved to Reading, Pennsylvania, where Victor set up The Gondos Company, a general contracting firm. In 1930, Gondos joined with his sons to form Gondos and Gondos, an architectural firm headquartered in Philadelphia that designed industrial buildings, schools, and hotels. Both sons garnered engineering degrees, but Victor Jr. was also an historian and archivist, and he served on the staff of the National Archives for twenty-three years. This diverse collection, which spans almost one hundred years, chronicles a Hungarian family's attempt to assimilate to the United States yet retain its heritage. It also documents the family's architectural and construction businesses from the mid 1920s though the Great Depression and World War II. The vast majority of this collection is correspondence between family members in the United States and in Hungary. There are also scrapbooks, audio materials, clippings, programs, pamphlets, journals, technical drawings, and photographs. (13.8 linear feet) Elba Farabegoli Gurzau was born in New York City, the only child of Italian immigrants. Educated in Italy and in New York City, she pursued simultaneous careers as a social service worker with immigrants in New York and after 1942 in Philadelphia, and a folk dance promoter. The papers include personal papers and diaries; correspondence, organizational records and ephemera from folk dance and folk arts groups; professional files from her work with the New York YWCA's Italian Mothers' Club program in the 1930s, the Philadelphia International Institute (later the Nationalities Service Center), 1942-1981, and the Philadelphia Committee for Italian Relief in the late 1940s; and drafts and research files for her book Folk Dances, Costumes, and Customs of Italy. Folk arts groups represented include Folk Festival Council of New York, Coro D'Italia and Esperia Dancers, all of New York City, and I Vivaci, Folk Dance Leaders Council, Folk Dance Demonstration Group, and I Ballerini, all of Philadelphia. The papers also include extensive records of the Italian Folk Arts Federation of America, which Gurzau helped to found in the 1970s. (171.2 linear feet) Beginning in 1882 the Indian Rights Association was one of the most important organizations establishing and influencing American Indian policy in the 20th century. The records of the organization span from its origins to the 1880s and include correspondence, research papers, administrative files, photographs, publications, and papers of Herbert Welsh, one of its founders. There are also numerous photographs, mainly from Western field trips, materials from the Council on Indian Affairs, and manuscripts and research notes regarding social and cultural Indian traditions. The Indian Rights Association also maintained close contacts with Indian agents and with Indians themselves through correspondence and annual field trips to reservations and settlements. The papers include many reports and letters reflecting these contacts. (0.6 linear feet) Shigezo Iwata was born in Japan and immigrated to the United States in 1924. Sonoko U. Iwata was born in Los Angeles. The couple made their home in Thermal, California where they farmed and Shigezo was secretary of the Thermal Farmers' Cooperative Association. Separated in the initial part of World War II when Shigezo was arrested and detained by the FBI at the Lordsburg Internment Camp (New Mexico), the Iwatas were reunited in 1943 at the Colorado River Relocation Center near Poston, Arizona. The collection contains letters between the Iwatas and their friends detailing life in the relocation center and the internment camp. There are also personal documents and biographical materials. (32.7 linear feet) Amandus Johnson was born in Langsjo, Smaland, Sweden and immigrated to the U.S. circa 1880. He was a leading historian of Swedish-American colonial settlement in the Delaware Valley, and a motive force in the promotion of Swedish-American historical consciousness. He helped to found a number of Swedish-American cultural organizations, including the American Swedish Historical Foundation and Museum, where he served as first curator. The collection includes correspondence, speeches, ephemera, and other records from Johnson's involvement in a large number of Swedish-American organizations, along with very extensive research files regarding Sweden's relations with North America from 1621 through the mid 1850s. (8.0 linear feet) Eugene Kleban was a member of the Polish Army General Staff at the beginning of World War II and a prisoner of war in Germany during the war. After the war he became a captain in the British Army and spent several years working for the Ministry of Labour and National Service in Britain before emigrating to the United States in 1951. Following a successful career as an electrical engineer, Kleban received a PhD in sociology from New York University in 1965. He became a professor at Wagner College, teaching sociology and industrial relations, as well as executive director of the Polish Institute of Arts and Sciences in America, and a member of the Mayor's Ethnic Minorities Council in New York City. The collection includes correspondence, clippings, classroom materials, student papers, resumes and recommendations, grant proposals, chapter drafts, blueprints and construction specifications, printed materials, and other items. (13.0 linear feet) Sumiko Kobayashi was born in Yamato, a Japanese agricultural community near Palm Beach, Florida, the daughter of Japanese immigrants. 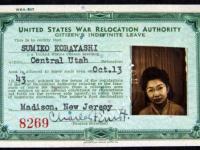 Her family was relocated from San Leandro, California under Executive Order 9066 in 1942 and interned in the Topaz Relocation Center in Utah. Sumiko was allowed to leave the camp in order to attend college through the help of the National Japanese American Student Relocation Council, and graduated from Brothers College, Drew University in Madison, New Jersey in 1946. She became involved in a number of Japanese civic organizations that brought awareness to the conditions of the Japanese in America and sought redress for the hardships that the Japanese endured as a result of their time in the internment camps. She moved to Philadelphia in 1947 and currently resides in Medford, New Jersey. The collection includes personal correspondence, documents, and photographs relating to the family's time in the Topaz Relocation Center, but it consists primarily of records of the organizations in which she has been active. It includes much information about the movement for redress in the Japanese-American community, as well as information on cultural and memorial sites dealing with Japanese-American history. In English and Japanese. (2.9 linear feet) Leon J. Kolankiewicz (1892-1971) was a Pennsylvania state assemblyman, the first Polish-American councilman at large elected in Philadelphia, and a strong advocate for Polish wartime and peacetime relief. A native Philadelphian, Kolankiewicz worked with various Polish-American associations to educate and inform citizens of efforts to help Poland and its people recover from recent wars. As a councilman, he consistently worked with and among the Polish community to ensure their places in Philadelphia's social, political, and economic schema. He also worked with other civic leaders to ensure the observance of important Polish events and holidays within the city. Kolankiewicz's papers are primarily related to his public personas as a city representative and as a Polish relief worker. Included in this richly varied collection are incoming and outgoing correspondence from Kolankiewicz, Judge Robert and Anne von Moschzisker, and Ignace Jan and Helena Paderewski; assorted booklets and pamphlets on such subjects as Polish war relief, Poland-United States relations, and Polish tourism; and publicity photographs of Kolankiewicz. A majority of the items in the collection are written or printed in Polish since Kolankiewicz often communicated with his Polish friends, colleagues, and constituents in their native tongue. (2.6 linear feet) Lapolla emigrated from the province of Potenza, Italy in 1890 with his family and settled in East Harlem, New York City. Lapolla was an educator in the New York City public school system and the author of several novels on Italian-American life in East Harlem. He also published two cookbooks. The collection contains correspondence, unpublished literary manuscripts including novels, short stories and poetry, and artwork. (6.0 linear feet) The son of a Ukrainian immigrant, Lourie became active in social work in 1928, running settlement houses during the 1930s, serving as Pennsylvania's Deputy Secretary of Welfare and as Senior Policy Adviser for the Institute for Economic Development (1980-1982) and the National Immigration, Refugee and Citizenship Forum (1983-1990), both in Washington, D.C. His academic activities included teaching in the graduate faculty of the School of Social Work at the University of Pennsylvania. The collection consists largely of reference files and related materials collected by Lourie in his work for the Pennsylvania Department of Public Welfare, the National Immigration, Refugee and Citizenship Forum and as professional consultant for Community Mental Health and Family Services, Inc., at the Philippine Refugee Processing Center in Bataan. These materials relate primarily to refugees from Vietnam and Cambodia, and include correspondence, reports, conference materials, clippings, and printed materials. (7.4 linear feet) Nagorski was a Polish emigre who worked as a journalist and editor in the United States. Previous to his time in the U.S. he worked as an attorney in Warsaw, as a member of the Polish government in exile during WWII (head of "lecture division"), and worked as a correspondent for the Allies during the war. In the United States, Nagorski worked as the editor of the Foreign News Service, and as a journalist with the Christian Science Monitor, the New York Times, The Wall Street Journal, the Denver Post, the Money Manager (East-West Trade), and the Boston Post. He also authored a number of books, his articles appeared in numerous scholarly journals, and he additionally provided policy papers for Carter during his Presidential campaign. A leitmotif of his writings was the tyranny and consequences of enforced Communist regimes. The collection includes Nagorski's articles and related correspondence; general personal correspondence; newspapers and clippings; articles and speeches; published brochures and books; personal documents; various manuscripts; and press releases. (4.0 linear feet) This collection contains the records of the New Immigrants Initiative, a multi-year series of projects started by the Balch Institute for Ethnic Studies and completed by HSP, which explored the history and experience of non-European immigrant communities in the Philadelphia area. The purpose of these projects was to document these communities for the historical record and to create interpretive exhibits, publications, and programs that educate about the recent immigrant experience. Five communities were initially part of the project, with four being fully finished: Indian, Arab, African, Latino, and Korean (started but not completed). Included in the collection are oral history transcripts, photographs, printed material, ephemera, and correspondence. There are also numerous audio cassette tapes and VHS tapes. (0.8 linear feet) Members from both the Pisano and Siciliano families of Philadelphia and Camden first arrived in the United States in the early 1900s, both from the town of Gasperina, Italy. This collection, compiled by Donna Meidt, highlights their genealogies through vital records, passports, family trees, and images (including digital images on one CD). There are also original photographs and Italian magazines, as well as a sampling of plays, operas, and poetry handwritten or transcribed in Italian by Antonio Pisano (1894-1979). Pisano was a poet, playwright, and member of the theatrical group the Philadelphia Filodramatic Circle Gasperinese. (0.4 linear feet) Scandella was born in Italy and was educated as a physician. He came to America circa 1796 and settled in Philadelphia in 1797. The collection includes a diary, commonplaces containing impressions of America, and medical case records. Journal and commonplace books are both rich in detailed observations about the United States at the end of the 18th century. Scandella's comments touch on a broad range of topics, such as Quakers, race relations, U.S. political culture and system, physical features of the land, Americans' character, and U.S. foreign relations. His notes also discuss a number of prominent Americans he met or befriended, including Washington, Jefferson, and Benjamin Latrobe. (1.0 linear feet) This collection contains records produced by the Balch Institute's South Asian Immigrants in the Philadelphia Area Oral History Project. The project was conducted in the summer of 1996, when project staff interviewed sixteen individuals about their heritage, country of origin, and experiences in the United States. Interview subjects discuss their family and life in South Asia, their careers, adjustment to American culture, the process of becoming American citizens, and the next generation's ethnic and cultural identity. The records in this collection are audiocassette recordings of the interviews and eight text transcripts. (46.8 linear feet) The Swiss Benevolent Society of New York is the oldest Swiss Benevolent Society in the United States, founded in 1832. From its inception, the Swiss Benevolent Society of New York has sought to care for the poor among the Swiss population of New York. The earliest records of the Society date from 1880 and include correspondence, board minutes, financial and administrative records, annual reports, newspaper clippings, blueprints and various printed materials. (0.4 linear feet) The United Singers of Philadelphia was an umbrella organization that represented approximately forty area singing groups, the majority of which were comprised of German immigrants. This collection dates from 1887-1932, although the bulk of the material is from 1905-1916. It includes a scrapbook compiled by the United Singers of Philadelphia, a German songbook, and a panoramic group photograph. The scrapbook contains detailed press coverage of German-American singers, musicians, and choirs, and political events in Philadelphia in the years before and during World War I. Contents include concert programs and reviews as well as clippings describing related (and often overlapping) political meetings and rallies.